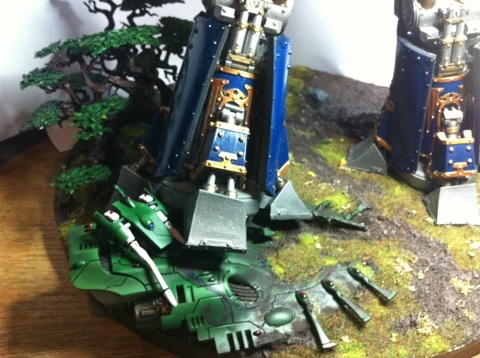 The Wraithlord towered above the Eldar warriors as they scanned the abandoned settlement. Even ancient Balora the Farseer had been born on Iybraesil and did not remember the primaeval, vibrant worlds of her people that had been destroyed in the Fall. These Crone worlds were all that remained of that unknown past. The embodied hero who loomed against the chaotic sky was another matter entirely. Her wraithbone body creaked softly in the eerie silence. 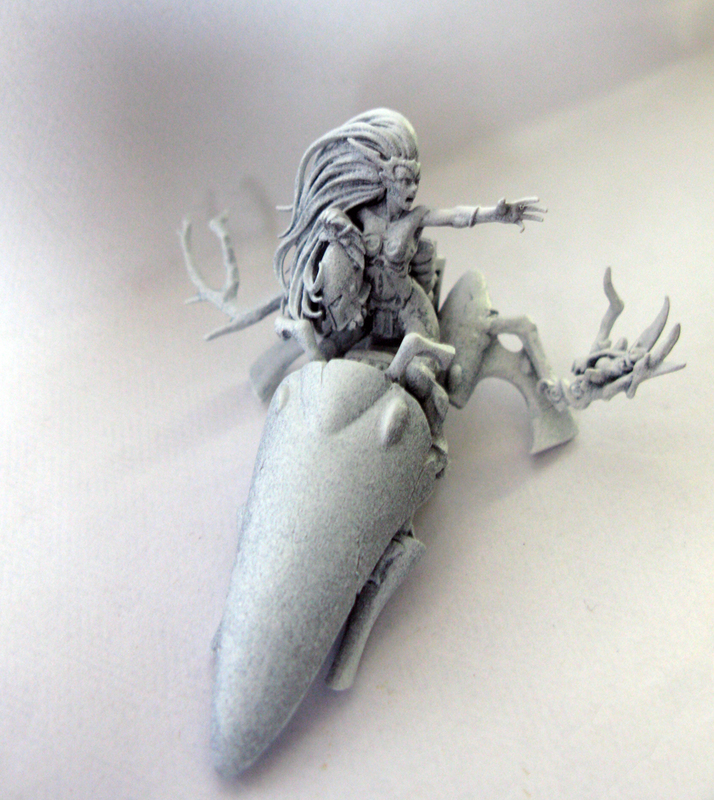 Adesha remembered, had wept in horror and psychic shock as the fledgling craftworlders saw the birth of She Who Thirsts from space. She had fought as one of the Goddess’s warriors for countless ages, had led her people in war, and now had been summoned again. The ancient wraithbone body had been grown for her a long time ago. A receptacle for her shade, drawn from Iybraesil’s Infinity circuit. She could feel the hot blood of the infinity rune painted on the face of her helm. It was one of the only things she could feel. The ghost in the machine concentrated, drawing the strands of herself from within the lattice of the wraithbone core to form a point of awareness. Adesha would speak. *Do you sense enemies yet, Farseer? My thoughts grow thin. If I am not needed I would return to the Goddess. * Communication was a burden. Combat was not. 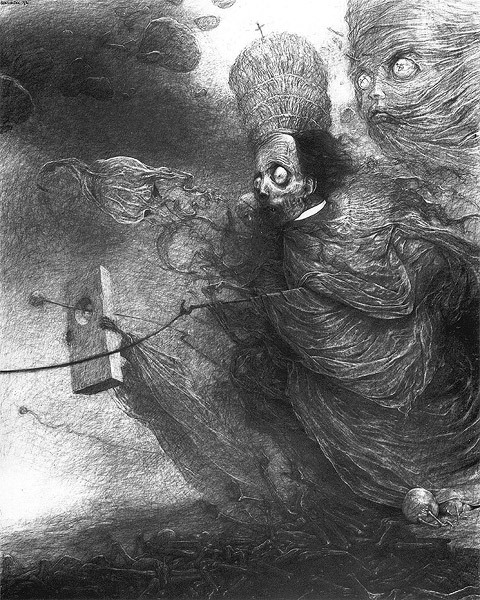 Balora cocked her head as the papery voice of the revenant hero entered her mind. The Wraithlord sounded flat, as one would imagine the dead would sound. 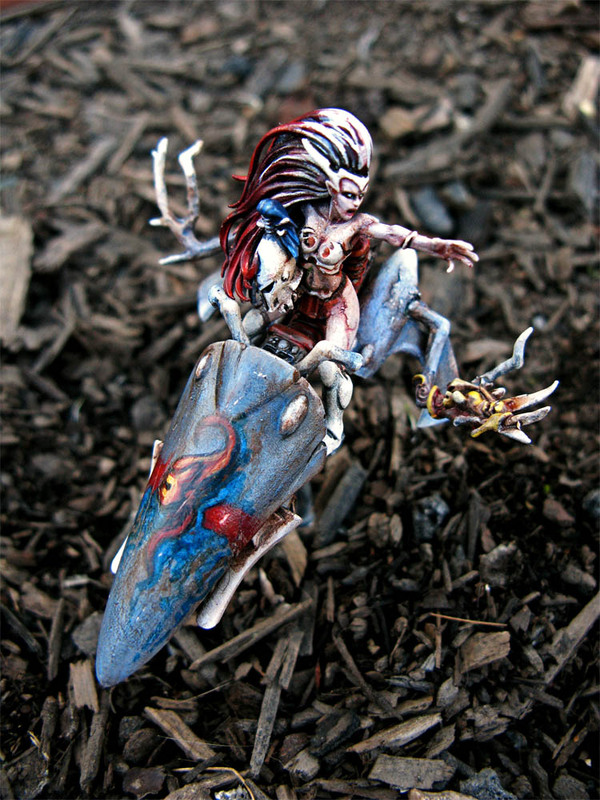 This is Adesha, the first of two Wraithlords I have planned for my Iybraesil Eldar warhost. She’s armed for anti-tank as there’s no other anti-tank capability in my 500 point army, and I thought it would probably still be a good configuration later. I’ve wanted a Wraithlord model for years and I finally got one. It’s more difficult to make it dynamically posed than I expected. I thought the arms and legs would be in two parts each but they’re only one, so the poses straight out of the box are a bit on the Frankenstein side. I looked at a bunch of anime mecha pictures to get a good sense of how an elegant humanoid machine should look, and then I added the scythe from the Empire Wizard kit to the shoulder and it really balanced the pose. I’ve been trying to use that piece for ages! The painting was fun. Again, I went for an organic, aged look, and if you’ve ever seen old chipped animal skulls (I grew up in the country) then you’ll agree it turned out pretty well. Overall they’re a great-looking model. 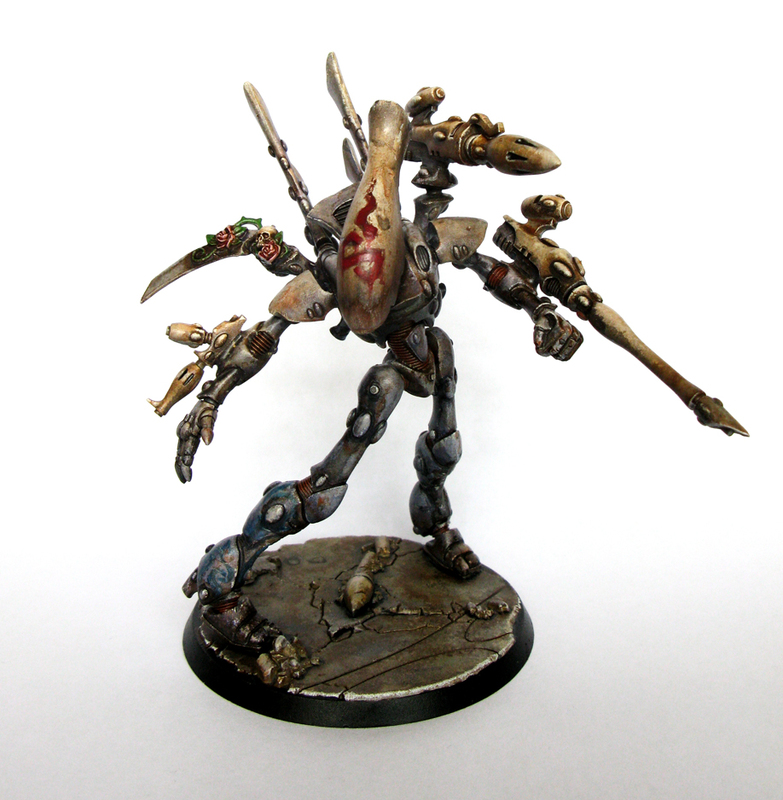 It looks sort of spidery and almost Tyranid-like I think, but also like a mecha, which is cool. Next up I’m painting my Domaru Butai for Infinity. Should be fun. 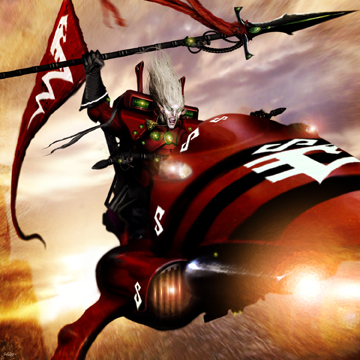 You gotta love a cyberpunk samurai. 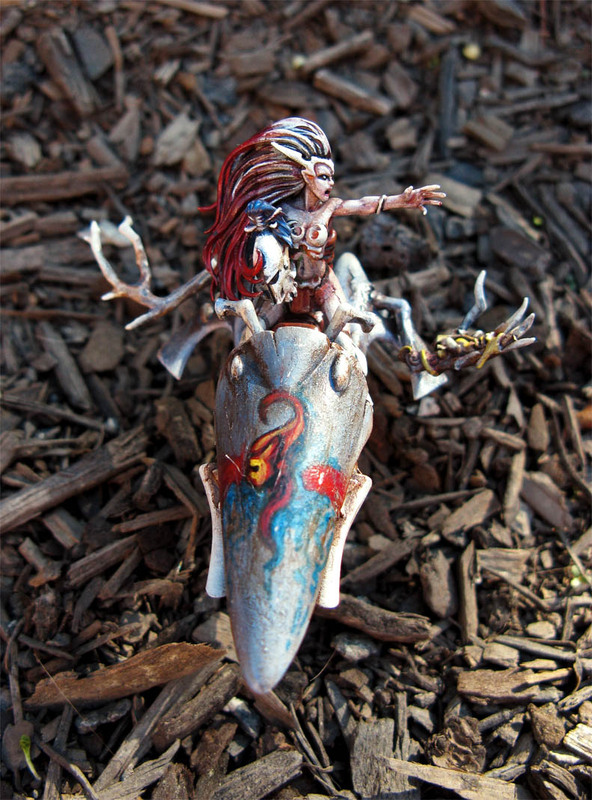 Well, I finished my Farseer, and I have to say I’m really stoked at how well she came out. 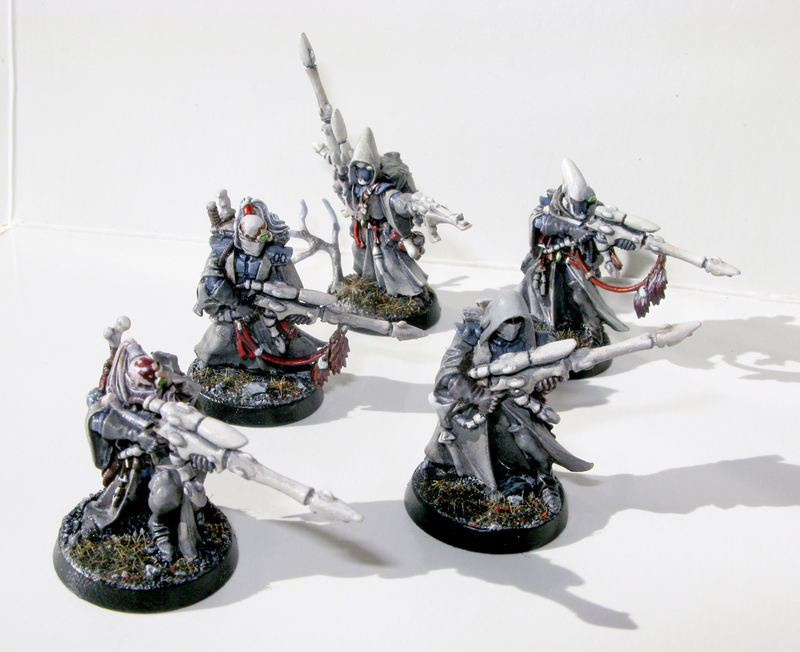 I want my Iybraesil Eldar to look a bit different to most Eldar armies – more weathered and ancient-looking. 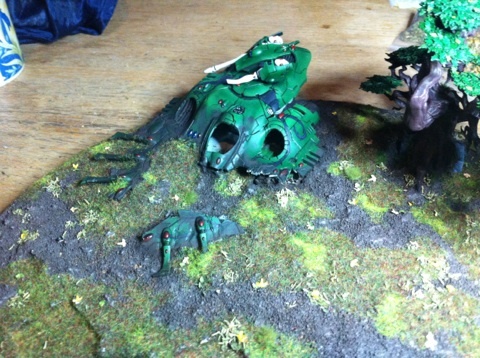 I also wanted to get across the organic nature of Eldar technology. I think I managed it. I also wanted to make the Farseer herself look eldritch and freaky, so I used bold and less realistic colours in places. I was going to paint bloody runes on her body but the blood-smeared hair and the scar on her leg came out so nicely that I decided not to push my luck! Sometimes I reckon you just have to abandon your plan if it no longer seems right. 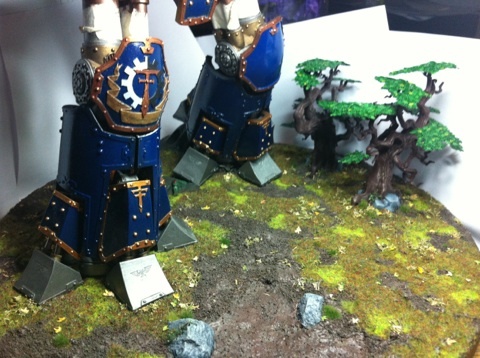 I tried to mask the canopy with vegemite so I could do the freehand, but because I was using a lot of washes the vegemite just melted and uh . 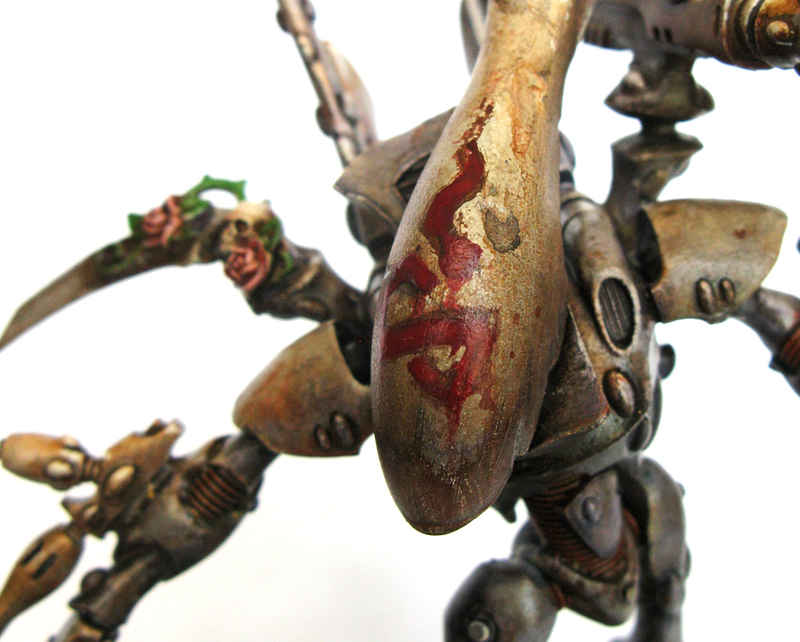 . . ended up being incorporated into the weathering. 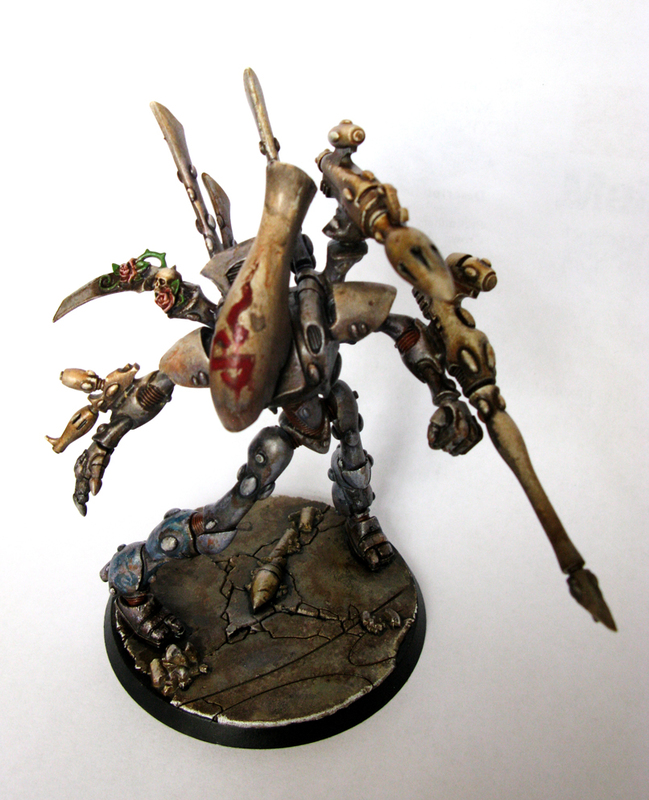 I really wanted the wraithbone to look like ancient, pitted bone. Basically it took a million washes in tan, brown and blue, and then at the end I dabbed little drops of very watery brown paint and blew on them so they ran backwards from the nose. 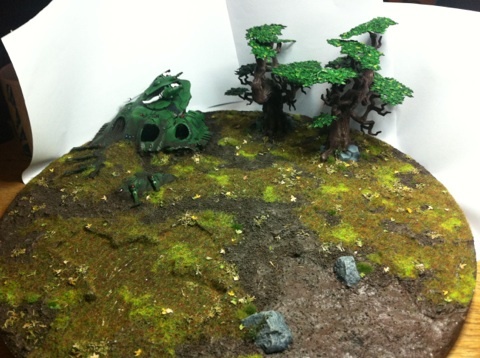 The last thing I did was grab a rough grade sand paper and just scrape it over the finished canopy. It was a bit nerve-wracking scraping sandpaper over something you just spent three hours painting but it was worth it I think. You might also notice that the photos are a lot better than usual. That’s because I didn’t take them! They’re by Rhebeka Stangret. I’ve been working on my Iybraesil Eldar a bit lately. 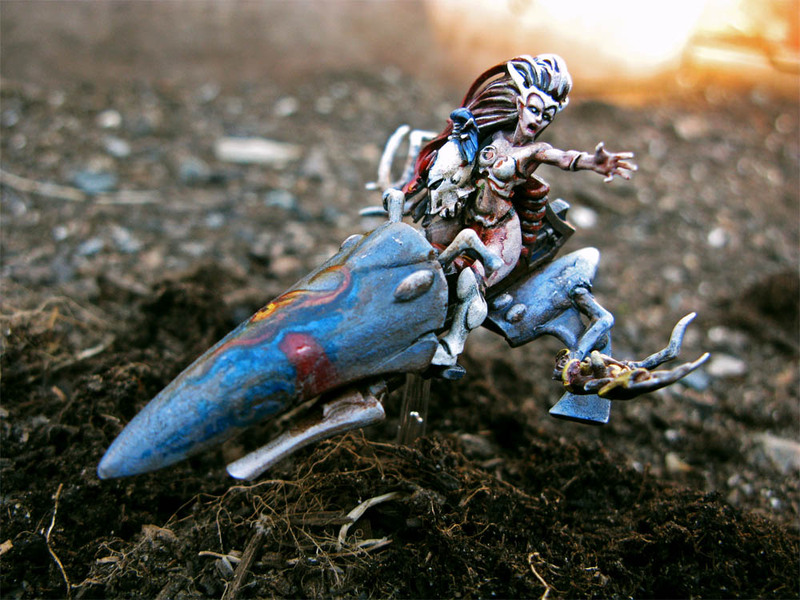 Here is my Farseer on her jetbike, undercoated with grey primer, a blue-black wash with windex and a quick spray of white undercoat to create the highlights. I’ll be using the same watery technique as I did on my Rangers. 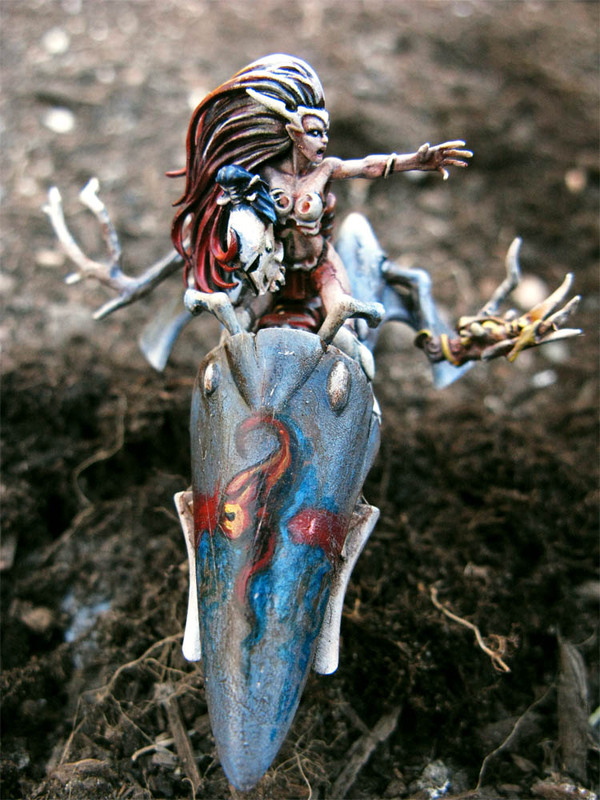 I’m really looking forward to painting the bloody warpaint and an image of Morai-Heg the blind crone goddess on the canopy. Apologies for the rough photos, I lack patience. I was originally going to use this Reaper devil lady I had lying around, with the scythe from the Empire wizard kit, but encountered several problems. The scythe was too gothic (much better suited to Sisters of Battle), the model’s metal head was extremely difficult to remove without damaging the really thin arms, and I didn’t like her boots. Overall it just didn’t look right. 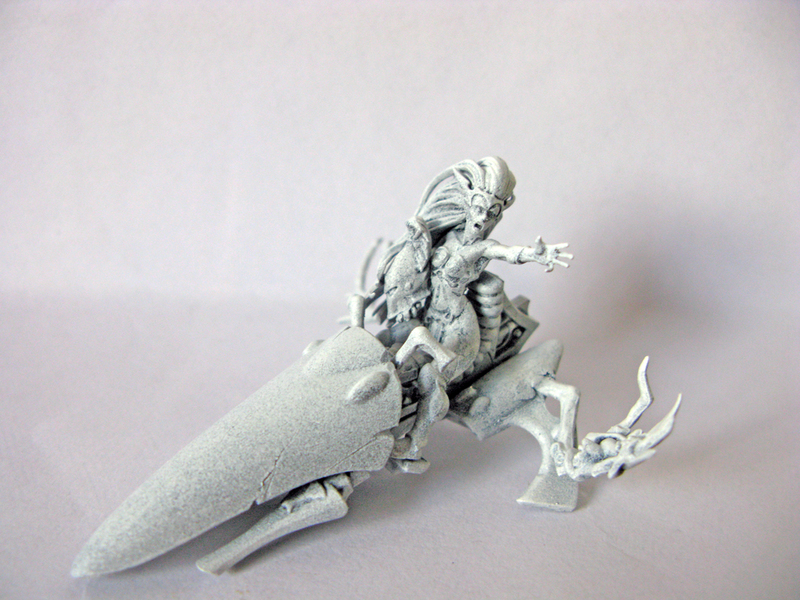 So I green-stuffed the new Dark Elf Sorceress to some jetbike legs and shaved the thighs down. Now she’s completely under-equipped for battle in her armoured boots and bikini top, in the time-honoured tradition of fantasy heroines. Meh. Who needs pants when you have psychically attuned warpaint eh? 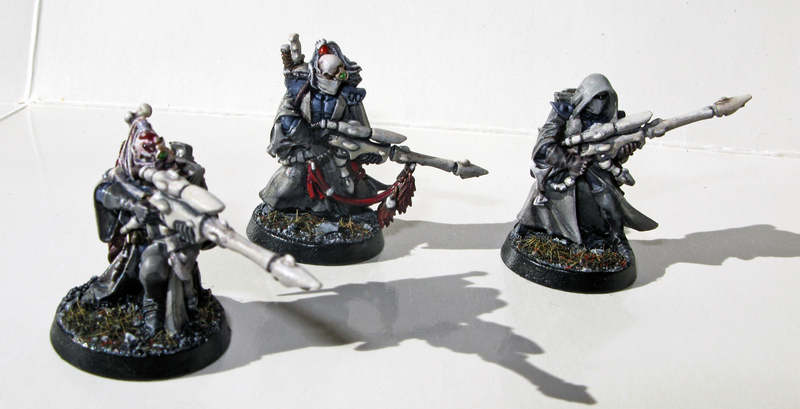 I’ve finally finished off my last three Iybraesil Rangers. They came out pretty well I think. I read in some Rogue Trader-era background that Eldar warriors wear warpaint under their armour as part of their whole adopting the warrior aspect thing, so I thought I’d try painting the ranger’s rune in blood on one of the elf’s foreheads. I think it looks neat, plus it’ll be good practice for my Farseer and warlocks whose rune-armour is going to be body-paint. Now to build the jetbikes. But first . . . I have to finish painting Lord General Drake, my counts-as Straken. I can’t have him still undercoated in the final apocalyptic battle of the campaign. Plus my Infinity guys will be arriving soon too. So many projects, so little hobby time.